Often reported to be present in gardens with daylilies but not necessarily feeding on them significantly, perhaps preferring other plants, Popillia japonica is an introduced pest which was first seen in North America in 1916 in New Jersey. It now occurs in China, India, Japan, Korea, Russia, and portions of the USA and Canada. The adults eat flowers, foliage and fruits of around 275 different plants. The larvae feed on roots, especially grasses. 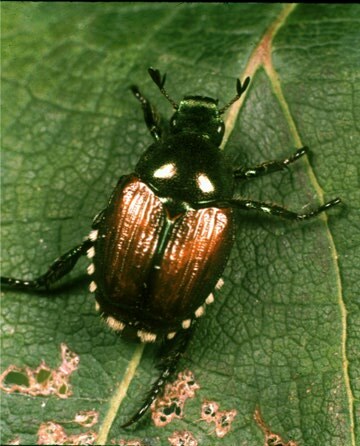 Japanese Beetles are present in at least parts of the following States: Alabama, Connecticut, Delaware, DC, Georgia, Illinois, Indiana, Kentucky, Maine, Maryland, Massachusetts, Michigan, Minnesota, Missouri, New Hampshire, New Jersey, New York, North Carolina, Ohio, Pennsylvania, Rhode Island, South Carolina, Tennessee, Vermont, Virginia, West Virginia and Wisconsin. The adult is oval in shape and a little less than half an inch in length, metallic green with copper wing covers which are marked with lengthwise fine stripes. The grubs are whitish with brown heads and usually measure under one inch; their damage is detailed under White Grub. The adults feed during the day, preferring those which are warm and sunny, and chew on foliage and flowers, with often just the veins of leaves remaining. They tend to feed in groups, and there is one generation a year. Control measures include handpicking (shaking beetles from plants early in the morning when they are sluggish and then destroying them), and applying milky spore disease or beneficial nematodes to turf to reduce the numbers of larvae. Neighborhood campaigns are often recommended.